An independent auditor has commented that the original is "terribly clean and stark" in comparison to previous years? I think its a very strong and recognizable image because of that though? Maybe a little something like through the middle? We didn't actually run that road did we? Think I've seen it before and somebody said it was Kangaroo Island in Australia. 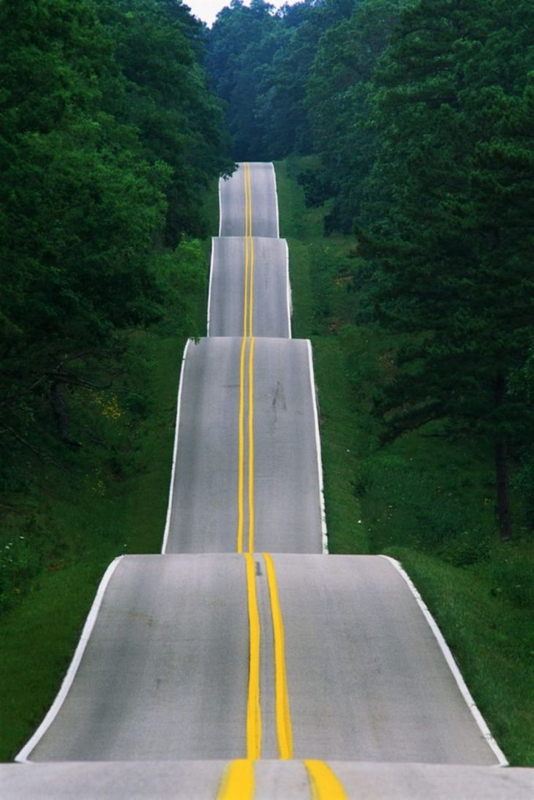 SS - it was the closest thing i could find to looking down an actual undulating and straight road. I like it the picture the way it is to be honest but linking it back to the RWUK group somehow would be a nice touch. From my perspective the fact that it emerged on this forum links it back? We could bung a union flag in one corner or spin the acronym RWUK into a roundel and plonk it somewhere, but, whilst there are a heap of UK based people on here its not solely used by them, there is an international mix to this merry band On the two previous patches we haven't pushed a RWUK identity? Things are pretty quiet around here too at the moment. Would appreciate views from a ton more people too ultimately before I do any mods or a total rethink. JAR - where are you planning to qualify this year? I am aiming for Detroit in October - good and early - no drama - ha ha! 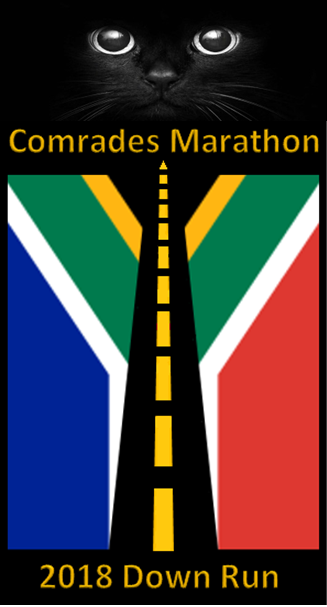 Keep the comments coming - anything is possible - I think I will round the corners off like the last patch which will mean the words Comrades and Marathon will need to go on 2 lines - I am thinking that a patch with dead square corners might be more prone to peeling off easily? I'm nearly finished nursing a sore knee back to health, I'd love to qualify this year and I was thinking about Marathon du Medoc with a friend who sadly withdrew. I was considering Bournemouth but I saw the route has quite a few out-and-backs so didn't fancy that one. Reckon Thames Meander in November is most likely for now, at least its flat and near home. Quite keen to register for Portsmouth Waterside again, its late in the year so helps limit the break around Christmas. Detroit sounds cool, how did you hear about it? I think rounded corners would be best. 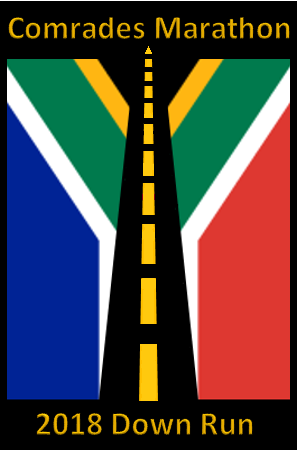 At the top of the yellow lane markers is a little triangular bit that looks like an arrow pointing upwards. I know it's just where the pattern runs out but maybe the little arrow bit could be at the bottom pointing down? Haven't been doing much running, but my hips or actually a bit lower are aching. I don't have the mojo at the moment. Don't want to do too much and put myself off by January but I do have a marathon to run in 14 weeks. Agreed, I couldn't depend on M-d-M for my pen allocation thats for sure. Drinking mid-race would be a new experience though! Think my first one in the qualification period is Jungfrau but I hope I don't need to rely on that! I've got Leicester in mind as the qualifier but have San Sebastian and Malaga as other possibilities. I was going to run Detroit back in 2008 after I did London, the attraction is that its run in two countries. But then I got drawn towards The Majors and Continents instead and ended up in Tokyo and Chicago instead followed by several others in those sets. Glad I did it that way around as some of those are quite difficult to get into these days. Finally its time to do Detroit. I continue to look for marathons with a weird kind of draw for me; want to land Nuuk one day soon too Didn't really enjoy "having" to run Manchester (again) and Milton Keynes this year, would rather have invested the effort elsewhere on marathons of my own choice. I like the look of M-d-M, but I better speed up a bit, no time for drinking on it and making that 5 hour barrier! Did you know there was a beer lovers marathon too? I think Marty qualified at the Thames Meander last year. SS the downward trend is meant to be from the bottom of the patch to the top - maybe its not that obvious? If you look at JAR's photo its the same perspective? The "road" gets narrower and the lines get thinner the further up the patch you go, but it is meant to have a downward perspective? Becca, those are some interesting places, how did you end up discovering those? I was going to do Malaga last year, it's fast and flat and easy to get to from the UK. But I'd been injured and wouldn't have had time to train properly so I decided not to go. And then they had torrential rain, and it was cancelled anyway because the city centre was flooded. I still quite fancy it. I was due to run Malaga last year RR, rain was indeed torrential but I was all ready to run it. They said that they were delaying the start but I was glad when they eventually cancelled it as I was too cold by then! It wouldn't have been safe but I had a nice run along the coast once the rain stopped. Since I didn't get to run it then I'm going back this year. San Sebastian is one that I've heard nice things about so I've wanted to run that one for a couple of years. Similarly Jungfrau has been on the wish list for a few years. Very true, i ran the thames meander last year. Well organised race by Dave Ross and lots of Comrades folk there. Definitely flat, although did get a bit lonely where i was in the field. Just signed up to Thames Meander on 4th November...will be pushing on 17 months from Comrades 2016 without racing. 4x4=16 weeks to get you in shape for that JAR, sounds perfect! I am going to try and address this long running hamstring jiggy that makes me a bit tentative about upping my pace away from the 12 hour barrier. After much reading up on the subject it appears that I need to slowly stress the beast with mechanical load to iron the blighter out. This will involve some pain apparently which is counter intuitive, most injuries you would not expect to work through pain, but it makes a good deal of sense to me. I need to "teach" my ham to flex properly... I don't want to end up with this "left leg wobble" next year again. The only problem is I am very rubbish at being disciplined and doing this recovery stuff. Had a great time in Durban seeing you all even though I didnt get a medal.....No lasting ill effect on the hip from the race and it was fine for the rest of our adventures. We hated the Hilton so have booked somewhere else next year. Finally posted my race report on the 2017 thread! Also finally started running properly again, after taking some time out with what I hoped was just a pressure point where the timing chip had been pressing into my foot. Seems it was, as with a 'donut' pad on my foot I was fine running 15 miles yesterday. Terry, very glad your diving turned out so well. Lowrez, I'd be very interested in you have a link available to share. I've never heard of this approach yet and like you have longstanding and lingering hamstring issues. It feels like I could snap the thing during speed work sometimes. Very interesting read, especially test results showing healed hamstrings being used less than the uninjured side even months after rehab. I haven't run properly for ages now but still feel the same dull ache re-occurring as when I was running 6 days a week so its certainly not healing with rest. Nordic curls it is.... thanks Lowrez! Hi guys, can a newbie ask a question? Hope so. For those staying in Durban how do you get from Durban to the start in Pietermaritzburg first thing in the morning. Perhaps you book a hotel in Durban and also in Pietermaritzburg for one night? The organisers lay on a vast armada of coaches which you purchase a ticket for at the expo. On the whole the thing is meant to be a lot smoother than that so its an early start required! Very few stay in PM. If you think about it... you'd have to go back to get your stuff... best staying in Durban. Some folks hire cars or take taxis up, it can get very congested. On top of the issues above we had to get off our coach last year and scamper the last k to the start. I was shocked at how many were running through the streets that late in the day. Essentially all the routes in get gridlocked if you don't stump up good and early.